Today is Friday!!! I am ready for the weekend. We only have one football game, and the rest is free to do whatever we want. I think we are headed up to the mountains to do some hiking, so that should be fun. Tomorrow is Cinco de Mayo, and as much as we love Mexican food around here, we don’t do much to celebrate. 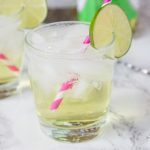 I do have something for you tomorrow though, so be sure to come back 🙂 Today, I wanted to give you a fun drink for the weekend. 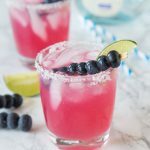 I know Margaritas are traditional, and I am all over a great Margarita, but I wanted to mix it up a little. I wanted something fruity! When I was at the grocery store this week I saw mango’s all over the place, and on sale. I don’t think I have ever actually purchased a mango, so I decided to pick on up. This drink seemed like the perfect time to use it. 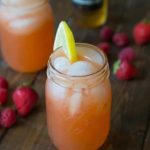 There is one slight problem with this drink … you need a blender to make it. I only have a food processor, and it doesn’t quite do the trick. The flavor was amazing, but it just wasn’t as smooth as it should have been. But trust me, head to the store pick up a a mango, and get out the blender! A frozen drink with vodka, mango's, lime, and lemonade! Blend everything together in the blender. 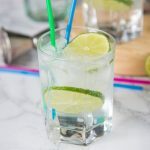 Pour into a glass, garnish with lime wedge. Serve. This looks SO refreshing. I’m at work, otherwise this would be ON right now. 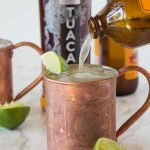 Erin – thank goodness it’s friday b/c I may just need to make me one of these tonight. i have all of the ingredients too! Never would have thought to combine mango with my crystal light lemonade mix! 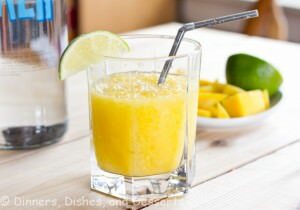 I love mango, this looks so refreshing! Have a great weekend, Erin! Congrats on making it to Friday! A trip to the mountains sounds like a perfect plan. We might just do the same. I need to head to the store and see if I can find some mango too. 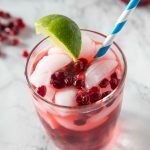 This drink looks fantastic. Oh hello new reason for the huge bag of mango in my freezer. Cheers to you too! 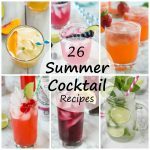 This looks like a cocktail for my friend Leanne, she loves fruity drinks. I would suggest an immersion blender instead of the standard stand blender, it is much more versatile. I have the Cuisinart because I love the attachments (a whisk that makes the fastest whipped cream or meringue) and a mini food processor (great for small amounts of dip, or just chopping garlic and onions), and of course the immersion blade which comes out of the appliance garage at least 6 times a week in my home! Thanks Eva! I actually have an immersion blender, but I never thought to use it here. I didn’t think the blades would be strong enough to deal with the ice and frozen mango. I will have to give it a try next time! Yay for having the time to be able to do whatever you want this weekend! I am so ready for this weekend you have no idea! This cooler looks like the perfect way to start everything out! I love Mexican food, but sadly enough we don’t celebrate Cinco de Mayo. However your Mango Cooler, looks a cause for celebration! It looks so tasty! Happy Friday to you! I love that you used Crystal Light for this. I have some in my pantry now. Mango is perfect too. Very festive, Erin! This looks so refreshing Erin! 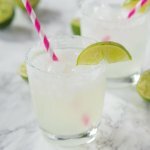 We have a Margaritaville blender that we get out every Cinco de Mayo so I am going to try this in it! I just need to get mango! 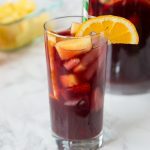 Mango is one of my favorite fruits, I would love a glass of this! This looks quite refreshing, smooth or not. Have a great weekend! 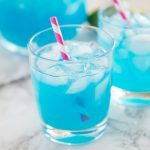 This drink looks absolutely incredible! It sounds like something we’d LOVE here! ….mangoes are one of my faves! There are mangoes all over the place at my grocery store too and now I’m totally inspired to buy one 🙂 This looks so good! 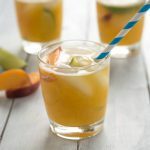 Ah jeez, I’m so happy to come across this post (though I wish I had found it before cinco de mayo…shucks…) I never met a mango recipe I didn’t love and fruity drinks have been all over my mind lately. We made some margaritas last night that just didn’t quite make the cut, so your mango citrus coolers probably would have sealed the deal. Hope you’re having a great weekend! Yumm! I love mango!! 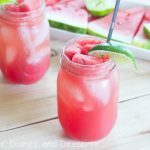 This looks so refreshing and delish! 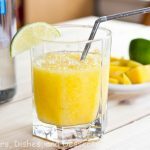 I love mango, and mango drinks sounds great! Yum, yum, yum! This is my kind of drink! 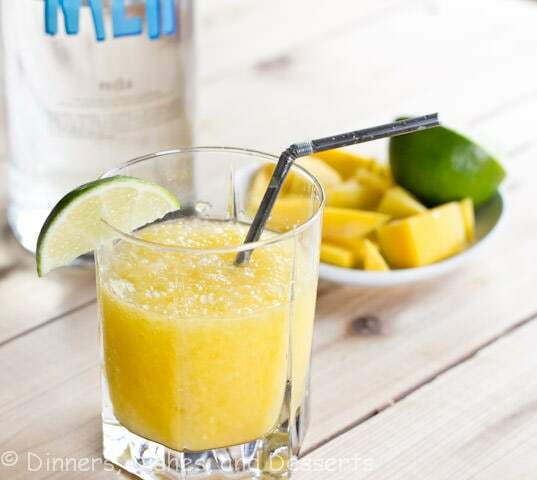 You had me at mango…and then I saw the vodka. Oh yes, please! It’s only 11:30 and I want one 🙂 Love mango!